Assorted white glass clip earrings. Neat white glass bead coil bracelet with screw back earrings. with a neat white glass bead coil bracelet. Excellent condition. Large white glass bead coil bracelet. Wonderful white glass bead stretch bracelet. Catch is stamped Japan. Braided white glass bead necklace with clip earrings. Clasp is stamped Japan. Neat white glass bead 14" necklace with glass clasp with screw back earrings. Catch is stamped Japan. Vintage 15" pressed glass bead necklace. Vintage West Germany 14" pressed white glass bead choker. Vintage 14" 10mm white bead necklace. 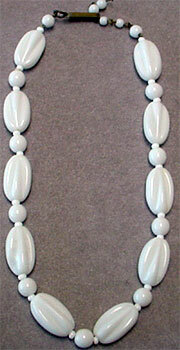 Vintage 14" 8mm white bead necklace. Vintage 14" white bead necklace.